Good morning polished world! How are you all on this fine Tuesday. Guys, I have a bone to pick with the weather around here. It's about 50 degrees in the morning, then in the afternoon it's 80 degrees and humid. The drive home is really creepy because there is fog on the waterway and fields I have to pass. It's just so haunting yet beautiful. With this weird weather, I am not feeling fall, yet I am not feeling like summer. Therefore I needed a perfect in between Summer/Fall manicure. 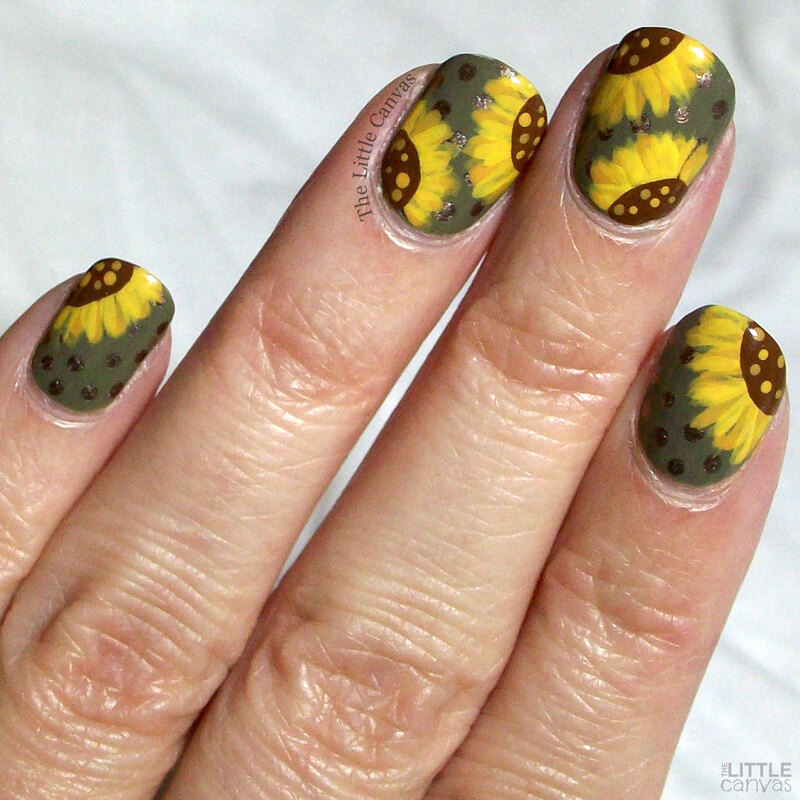 After seeing a sunflower manicure on olive green polish done by 25 SweetPeas, I had to re-create it. It was so fitting for this type of weather! Absolutely LOVE this manicure!!! Especially because that base. 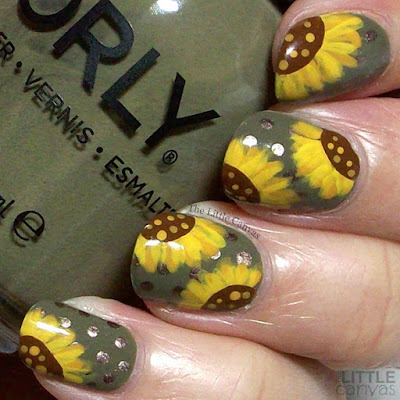 ORLY Olive You Kelly is a gorgeous olive green polish which covered completely in two coats. I really wasn't sure how I would like this color on me, but I absolutely loved it. Makes me want to go re-visit some polishes I bought years ago and never wore because I didn't think they'd look good on me! I also loved Fall Into Me, which is the shimmery dusty gold polish. It worked wonderful for the polka dot design on top of the base. Now I covered it up a lot because my sunflowers were so big, but I do not regret the size of them. I seriously LOVED how they turned out. What do you think? Enjoy the sunflowers? Love that base color? I need to get more Fall colors in my life. Actually, I need Fall in my life. Maybe then I'll start feeling like doing some Halloween designs.